For centuries, the Irish have held an enviable reputation as top breeders of horses and ponies, known the world over for producing talented, athletic Thoroughbreds and sport horses, as well as Irish Draughts. However, there is one breed that remains truly special in the hearts of the Irish people: the Connemara Pony. As the only known breed native to Ireland, the Connemara Pony dates back some 2,500 years and has survived the test of time, continuing to gain admirers. The Connemara is particularly loved for its athleticism and hardiness, but it is the breed’s wonderful character that makes the Connemara Pony a unique and popular favorite in equestrian households across Ireland and beyond. With this in mind, Goaley always believed that one day she would run a business involving her ponies beyond the breeding operation. After noting a distinct gap in the Irish tourism market for specialist riding holidays in the region of Ireland that is home to the Connemara breed, Goaley saw an opportunity. “There is no better way to experience the wonderful vistas of mountains, rivers, lakes and bog lands than from the back of a native horse or pony,” she says. 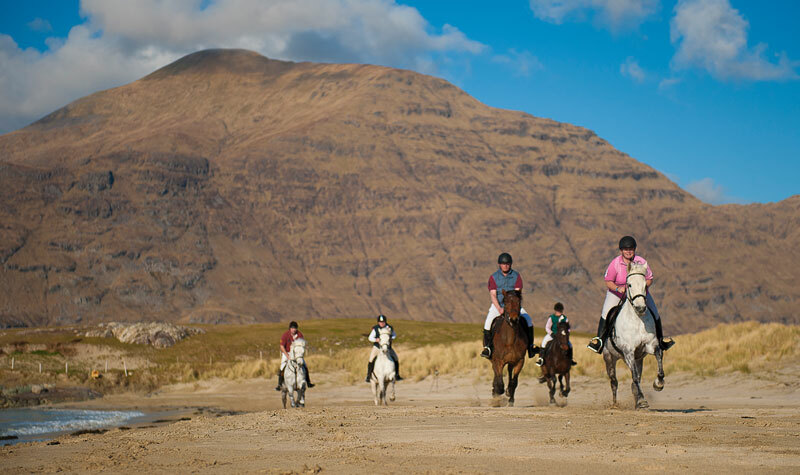 “Of course there were other riding outlets, but we wanted to offer something a little different, something to appeal to a wider audience.” And so, in 2012, Connemara Equestrian Escapes was born. 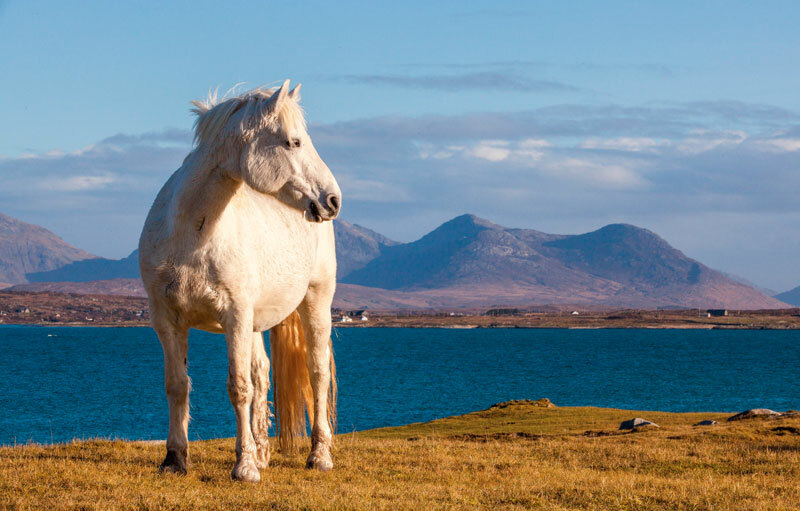 As the name suggests, Connemara Equestrian Escapes offers the opportunity to get lost in this beautiful, rugged land while surrounded by these wonderful ponies. However, it is the cultural side of the holiday that adds appeal to many people visiting Ireland for the first time. Goaley takes pride in her selection of ponies available to guests, allowing her to match ponies to riders of varying levels. Packages are often tailored to suit the more experienced riders who are comfortable at a canter, but novice riders are also welcomed all year round. Groups are kept to a maximum of eight riders for a more personal experience. 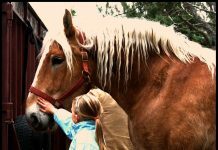 “All of our ponies are lovingly cared for and they demonstrate their payback in the form of trustworthiness,” Goaley notes. Without a doubt, Connemara is one of the most beautiful locations in Ireland. From the bogs and lakes of the Gaelic-speaking South Connemara to the mountain vistas of North and West Connemara, the diversity of the landscape offers much to the visitor. Having grown up on the edge of Connemara, close to Galway city, Goaley and her family have built up wonderful relationships with the locals in the area, bringing character and personality to the guest experience. “There are so many well-known breeders of Connemara ponies in the area, and we are delighted to be able to offer visits to some of the finest stud farms in Ireland,” she says. After an exciting day in the saddle, which might include cantering along glorious sandy beaches or through vast woodlands, riders are then introduced to such top Connemara pony breeders as Henry O’Toole. A native of the area, O’Toole is the founder of Castle Connemara Ponies, which offers some of the most successful bloodlines of the breed. His ponies have amassed multiple championships over the years, and many of them have gone on to achieve success overseas. Guests will be intrigued to learn that many of O’Toole’s breeding mares spend much of the year grazing on open land close to the sea, and often return to the farm just in time for foaling. During their stay, guests can also enjoy a visit to the Connemara Pony Museum, where they will learn about the history of the breed. A walk along the paths of the historic Kylemore Abbey, a Benedictine monastery founded in 1920 on the grounds of Kylemore Castle, is currently the No. 1 must-see attraction in Connemara and the west of Ireland. “We offer a wide range of activities that can be tailored to suit guests, and this also includes a trip to a smoke house or even a sheep farm,” says Goaley. Other attractions include a night of ceoil agus craic (the Gaelic expression for music and fun) at one of the many traditional music sessions in Renvyle House Hotel. Renvyle House Hotel is one of the main accommodation partners with Connemara Equestrian Escapes and a firm favorite among guests. The country house is famed for its delicious food and has won many awards, including Culinary Haven of the Year 2012-13. So too is Cashel House Hotel, which is located 8 miles from the beautiful fishing village of Roundstone, a beacon for artists and naturalists. Also a partner hotel, Ballynahinch Castle is one of the finest four-star castle hotels in Ireland and, along with a superb restaurant, offers guests something extra when it comes to luxury. The stunning Teach na Corra has also been included as one of the select accommodation providers. This modern farmhouse sits on the edge of Lough Corrib in a beautiful and peaceful rural area and allows guests to feel right at home. Plan your escape to Ireland now (see below for details), and experience the beauty of the Connemara region from the back of a treasured native pony. “Time is precious in today’s world and our luxury holidays will make the most out of every moment,” says Goaley of the unique and memorable guest experience offered by Connemara Equestrian Escapes. The summer months are the best time to visit Ireland, especially if you plan on taking a riding holiday. However, as everyone knows, Irish weather is unpredictable, and it rains a lot! Peak season is between April and October, and this can be the best time to enjoy all of the other cultural activities available. This special six-night package coincides with the world-famous Connemara Pony Show in Clifden, in the heart of Connemara. Attractions include daily riding on these wonderful ponies, as well as visits to the famous three-day show, where you will see the finest examples of the breed being put through their paces in-hand in the showing classes and under saddle in show jumping, dressage and performance competitions. Check out www.connemaraequestrianescapes.com for upcoming packages and specials, or email info@connemaraequestrianescapes.com for details.